The barn project is progressing slowly - with a lot of contemplation between every step. I have to muster my courage a lot!! - There's a really nice cross stitched jonquil pattern HERE. If you go HERE and look at the bottom you will see links to different flower patterns for each month of the year. Really pretty! 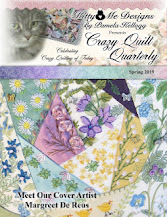 And if you check out her free patterns in her sidebar there are a number of others that are really nice. - Go HERE for a tutorial for a cute zippered bag. And HERE for a tutorial to make a hanging basket. - I didn't know dog ears on pillows were a 'thing' but evidently they are and you can find out how to avoid them HERE. - Are you an itty bitty scrap hoarder? Do you want to stop hiding them and feeling guilty? Well, how about making THESE? - I really like THIS - not sure I'd actually wear it, but I love it. Another anonymous quote for you...."A recent study has found that women who carry a little extra weight live longer than the men who mention it"
The barns are sure progressing. Nice! Great links too. I like the hanging baskets. Slow and steady..... it's really great to see the progress. Very nice. 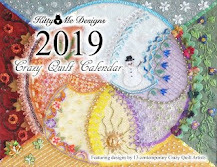 Thank you for the link, those quilt magnets are adorable. Both barns are looking fabulous, Mary Anne. There is no limit to your creativity! I've seen that quote before and it still makes me snicker. What is the fabric you are using for the barn siding. I'm telling you, you have done amazing embellishment to it. This piece is really coming together. I would have never thought of making magnets from tiny scraps! It’s looking great! One step at a time and before you know it WALA it will be done! Your barn is wonderful. So real looking. That tip for the itty bitty scraps was made for me...I already have the magnets. Love the close up of the smaller barn. It really looks so old and broken down. I just had to scroll back through your posts to see what I missed while I was away. WOW! This barn is looking amazing! YOu are ever so talented, my friend.